‘Burning the Sound’ is a sound performance about the nature of rituals, power and control. It uses fire from a regular fire lighter to subvert patterns of rhythm, exorcising the sound as a spiritual strategy. Fire was probably the first technology to exist and is knowledge based and ritualistic. Within ‘Burning the Sound’ digital, new media and ancestral technologies fuse to question contemporary strategies of invisible control. 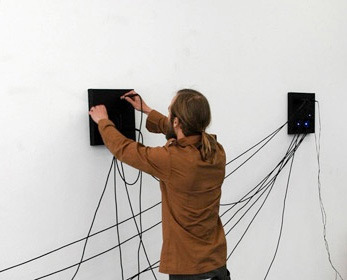 The aim of the performance is to push the ritualistic primitivism, gesture and body to technological mediated computer sound performances. Rudolfo Quintas (PT) is a software designer, visual artist and founding member of the SWAP project who works in the field of augmented performances and interactive installation. Rudolfo’s work focuses on the exploration of new concepts and vocabularies in transdiciplinary media arts practice. From this perspective he has been developing customised software, which utilises gesture and movement for visual and musical, dance and movement based performances. Creating interactive systems, he is interested in rendering participants subjectivity and intimacy in deep feedback loops, which explore notions of growth, ’self’ and ‘other’. For the piece ‘Burning The Sound’ he has been collaborating with mixed media, visual and sound artist André Gonçalves to create a dynamic visual-sound-scape, which are based on the movements that Quintas choreographs in real-time, using lighters and computer vision techniques. ‘Resonant Objects’ brings together sound and space through sympathetic vibrations, in which sound is used as a medium to excite space to be heard, in order to render audible its natural resonances - sound multiplying in and by space. The sound coming from the objects is strictly related to each object's spatial characteristics, it's shape, dimensions and material, but also their interaction with the site-specific architecture and the very space that hosted all the objects, it's spatial characteristics and environment. André Gonçalves (PT) works across the fields of visual arts, music, video, installation and performance. Originally trained in Graphic Design alongside his commercial work he has been developing several applications in Max-MSP, flash, java and C++ along with various experimentations in the analog world. Since 2002, he has been refining his ‘do it yourself’ approach to electronics, experimenting with sensor interfaces, old and new hardware and various techniques to create intermedia pieces. Recent projects have included interactive installations such as ‘Resonant Objects’ (2006), ‘I Thought Some Daisies Might Cheer You Up’ (2007) and ‘You Got Me Floatin' (2007). His discography includes releases on the labels Grain of Sound, Crónica Electrónica and Sirr (PT), Cherry Music (JP), Winds Measure (US) and Transacoustic Research (AT). Instrument maker and musician Ivan Franco. 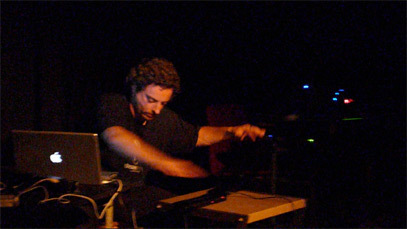 ‘Air Stick’ is a new musical instrument, created by Franco, which is ‘played-in-the-air’ (similar to a Theremin). The instrument, built using proximity sensors, allows for real-time control between hand-position and active sound manipulation. Ivan Franco (PT) is an electronic musician and digital artist focused on the development of new interfaces with machines. He presented performances and installations in the main electronic arts venues of Barcelona (CCCB, Metronom, Phonos, Art Futura), developing common projects and collaborations, both as musician and interactive systems designer, with people like Konic Thtr, Su-studio, Bert Bongers, Carlos Zíngaro, Rui Horta, Marija Stamenkovic, Marko Brajovic or Pedro Carneiro. He is also the R&D Director of YDreams, in the fields of interactive and ubiquitous computing. BOP are Teresa Dillon and Kathy Hinde. Since early 2007, they have been performing together and combining their backgrounds in live art, theatre, visual arts and music. As BOP they create experimental visual-sound pieces, with a theatrical, electro-acoustic inspired twist. Teresa Dillon (IRE/UK) is an artist, research and producer. Her interdisciplinary, mixed media work focuses on the exploration of the sociocultural and economic relations, behaviors and forms of communication, which emerge within and between different systems or ecologies. She specializes in creating location-based, performance- sound installations such as ‘Star Gone Tones’ (2005) and ‘seeing at a distance’ (2008). Since 1999, she has also worked as a live art performer, creating location-specific works with companies such as Pearson and Brookes et al (2000-01) and as part of the duo Paul and Paula (2003-04). Alongside her individual practice, Teresa established and currently runs the Bristol based collective Polar Produce (including Kathy Hinde, Philip O'Dwyer and Maarten de Laat). Through Polar Produce she co-organizes the OFFLOAD programme and makes location based live art and installation works using old and new technologies, such as ‘Measc’ (2005), ‘Taking Ground’ (2006) and ‘Come Outside’ (2007). In 2007, Teresa set up N.I.P. – New Interfaces for Performance a European touring network and research space for practitioners working and developing interfaces for live performance and interactive installation. Teresa’s work has been shown internationally, she has published on topics such as creative collaboration, new media and design and works as a freelance producer and lectures at Cambridge University. Kathy Hinde (UK) creates work, which combines audio and visual elements. 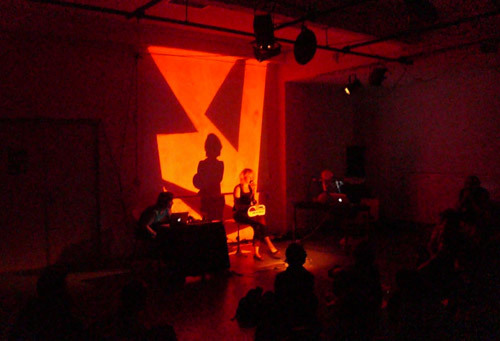 Originally specializing in sculpture and composition, she uses various techniques to create video and site-specific installations (1000 Birds, Missing People, Soliloquy, Glass House), sound art (Waterbell, Vexations) and composition (Meteor Shower, 5 Haiku, BOP). Her work has been shown across the UK, Europe, China and South America. She regularly collaborates with contemporary musicians such as Agrare, Joby Burgess, Elysian Quartet and Matt Fairclough and she has worked with composers such as Joanna MacGregor and Stephen Montague and the international choregrapher Jin Xing. She is a member of the Bristol based collective; Polar Produce with whom she creates mixed media, location-specific performance and installation works (Measc, 2005; Taking Ground; 2006; Come Outside, 2007, OFFLOAD, 2007). Musician, instrument maker, hacker and visual artist TokTek, eclectic electronic style has been described as ‘illogical hardware bending’. The outcomes or electronic ‘songs’ are played via hacked joysticks and various objects (plastic toys, records etc) to create dramatic live compositions, which break down into delicate and tender sound moments. 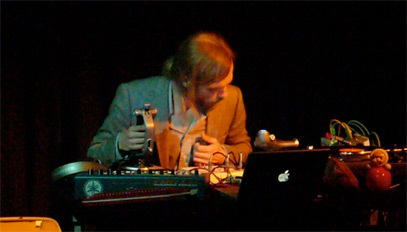 Other performances, such as ‘Moederkoek’ explore the communication and non-communication between electronic devices and humans, focusing particularly on his relationship with such devices. In ‘Moederkoek’ he samples he mother live as she bakes a cake. While ‘Crackle Canvas’ plays with the concept of a ‘painting orchestra’, using STEIM (NL) crackle box hardware. For Pixelache, Tom will be performing using his ‘Crackle Canvas’ and as TokTek. »» For more information about Torsten Lauchmann's piece, see Pixelache Lounge Exhibition. N.I.P. is kindly funded by the PRS Foundation for New Music (UK), Mondriaan Foundation (NL) and the Calouste Gulbenkian Foundation (UK and PT), with support from Polar Produce (UK) and institutional support from STEIM (NL), Watershed, Cube and Arnolfini (UK), Restart, Lisboa20 and O Espaço do Tempo (PT).